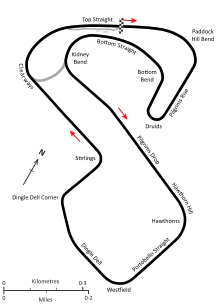 The 1974 British Grand Prix (formally the John Player Grand Prix) was a Formula One motor race held at Brands Hatch on 20 July 1974. It was race 10 of 15 in both the 1974 World Championship of Drivers and the 1974 International Cup for Formula One Manufacturers. The 75-lap race was won by Jody Scheckter, driving a Tyrrell-Ford, with Emerson Fittipaldi second in a McLaren-Ford and Jacky Ickx third in a Lotus-Ford. Jody Scheckter won the race for Tyrrell. Emerson Fittipaldi finished in second place for McLaren. Lauda completed just 73 laps but was allowed an extra lap after the team protested his exit from the pit lane was blocked after a late wheel change. He initially classified ninth, but was awarded fifth place after appeal. Lombardi used number 208 because her car was sponsored by Radio Luxembourg, who wavelength was 208 metres (equivalent to a frequency of 1439 kHz). ^ "1974 Formula 1 World Championship Programmes". The Programme Covers Project. ^ Lang, Mike (1983). Grand Prix! Vol 3. Haynes Publishing Group. p. 42. ISBN 0-85429-380-9. ^ Lang, Mike (1983). Grand Prix! Vol 3. Haynes Publishing Group. p. 44. ISBN 0-85429-380-9. ^ "1974 British Grand Prix". formula1.com. Archived from the original on 18 January 2015. Retrieved 22 December 2015. ^ "I remember Damon Hill once running in a car bearing the number 0. Is there any number that has never been used in a grand prix?". Ask Steven – ESPNF1.com. Retrieved 23 June 2012. ^ a b "Britain 1974 - Championship • STATS F1". www.statsf1.com. Retrieved 13 March 2019.